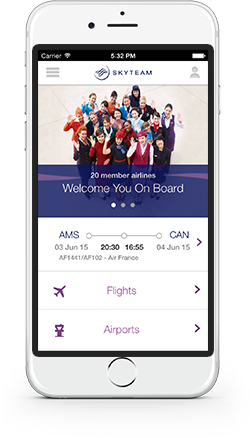 AMSTERDAM, October 2nd 2018 – As part of its continued focus on providing the best multi-airline experience in the industry, SkyTeam has made it easier than ever for top frequent flyers to share their feedback and suggestions when they travel via its SkyPriority Audit app. The global airline alliance has added a host of new features and plans to use customers’ feedback to continue shaping the alliance centered on customer experience. The innovative customer feedback app comprises over 12,000 elite-level frequent flyers from across the alliance’s 19 members. It uses feedback gathered in real-time to ensure consistent standards at every SkyPriority touchpointfrom check-in and security to boarding and baggage collection at more than 1,000 airports worldwide. Future vision: the new ‘Jet Setters’ community is a platform for research beyond the standard SkyPriority touchpoints. Panel app members can participate in moderated discussions relevant to SkyTeam, submit ideas for future developments and help form the future of the alliance. Easier access: top frequent flyers can now sign up to become a new observer in a matter of clicks via the app. A series of three simple questions qualifies their eligibility, replacing the previous online registration form. Once a member, observers can also log-in via their Facebook account – another new feature. Competitive edge: to recognize and reward contributors for their feedback, SkyTeam has introduced a ‘Your Contribution’ rating system. Auditors can see how many reviews they’ve submitted and are awarded badges for reaching targets, including the number of airports, observations, pictures and more. The SkyPriority Panel app is available in 16 languages and free to download, it enables frequent travelers to review their experience, add comments and upload photos. Information is shared across member airlines in real-time to quickly identify and rectify any potential issues. To become part of the auditing community just download the SkyPriority Panel app from your preferred app store and you can start contributing straight away. SkyTeam is the global airline alliance with 19 member airlines working together to offer seamless travel on an extensive global network. SkyTeam customers can unwind in 600+ lounges as they travel, earn and redeem Frequent Flyer Miles. SkyTeam’s First, Business and Elite Plus customers are eligible for SkyPriority services. The 19 members are: Aeroflot, Aerolíneas Argentinas, Aeroméxico, Air Europa, Air France, Alitalia, China Airlines, China Eastern, China Southern, Czech Airlines, Delta Air Lines, Garuda Indonesia, Kenya Airways, KLM Royal Dutch Airlines, Korean Air, Middle East Airlines, Saudia, TAROM, Vietnam Airlines and Xiamen Airlines. SkyTeam welcomes 730 million customers each year on more than 16,609 daily flights to 1,074 destinations in 177 countries.